Cyberbullying is using technology to deliberately and repeatedly bully someone. By reporting it, talking about it and supporting each other we can stop it. Cyberbullying is when a child, preteen or teen is tormented, threatened, harassed, humiliated, embarrassed or otherwise targeted by another child, preteen or teen using the Internet, interactive and digital technologies or mobile phones. It has to have a minor on both sides, or at least have been instigated by a minor against another minor. Once adults become involved, it is plain and simple cyber-harassment or cyberstalking. Adult cyber-harassment or cyberstalking is NEVER called cyberbullying. Name calling is a big part of cyberbulling. Itis one of the most used types of bulling not only on the Internet but all over the world in schools and loacal comunities. 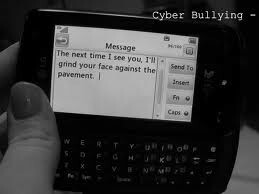 Threatening is one of the most scariest and effecting type of bulling. it can cause alot of people trouble because there scared to speak out because they might hurt them after they get into trouble. Some times it can lead to physical bullying which is propery the worst type of bullying beacause it can leave you bruised and cut but also can put you into hospital and cause alot worse consequences.